Rink Rover: How has Mike Gillis not been fired? How has Mike Gillis not been fired? I can't believe that I have the opportunity to write this post. It's astounding to see that Mike Gillis is still employed as a GM while the Canucks' season continues to capsize. Following Vancouver's recent struggles, the only major firing involves one thousand concession workers, who have been turned out of Rogers Arena as Canucks Sports & Entertainment prepares to transition from using an off-site hospitality company to running their own food and drink services. Yep, ownership is stepping in to reassert control over the team one hot dog at a time. Unless the ownership group intends to hand out free beer to help fans commiserate each loss, I fail to see how this move helps the Canucks' current conundrum. The suits behind the team seem content to fiddle with revenues while the franchise burns. Also, the Sedins are apparently supplementing their salaries in a manner that is not conducive to a desireable team image. Meanwhile, the architect of the crestfallen Canucks has been aiding the opposition by steadily routing his own roster. According to Sun Tzu, effective generals make their weaknesses look like strengths, and their enemy's strengths look like weaknesses. Gillis has engineered the exact opposite result by obliterating his club's greatest area of strength: goaltending. A mere three seasons ago, Vancouver was a puck-stopping powerhouse: Roberto Luongo and then-rookie Cory Schneider won the Jennings Trophy for having the lowest goals-against-average among all backstopping tandems in the NHL. Now both premier netminders are lacing-up elsewhere, leaving the Canucks' flimsy defence with no backbone between the pipes. I'm not trying to slight Eddie Lack. Indeed, I feel terrible for him as the latest goalie caught in Vancouver's ongoing crease controversies. After the team's torrid affair with Schneider and an on-again/off-again relationship with Luongo as the team's starter, Lack's position as #1 goalie seems like a marriage of convenience. 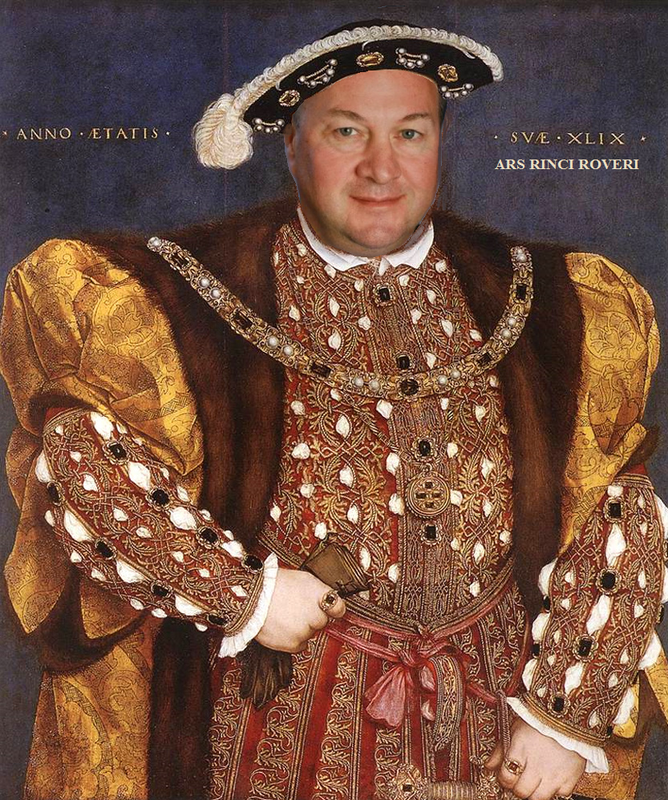 While Gillis is not entirely to blame for problems with the goaltending personnel, the rate with which he's promoting and discarding netminders make him look like the Henry VIII of NHL GMs. My interpretation might be coloured by Gillis' official portraiture as GM. You don't have to be an expert in sports management to conclude that this wasn't exactly a "hockey trade." Just kidding--the Canucks received actual assets for both goaltenders, but neither package is particularly helpful at the moment. That block quotation was just a reminder that we should not rely on wikipedia for anything other than comic relief. John Tortorella has been offering his own brand of comic relief by discussing the Canucks' situation in graphic-novel terms. Torts claims that Lack's takeover of the starting gig from Luongo is akin to Robin taking over the role of Batman. 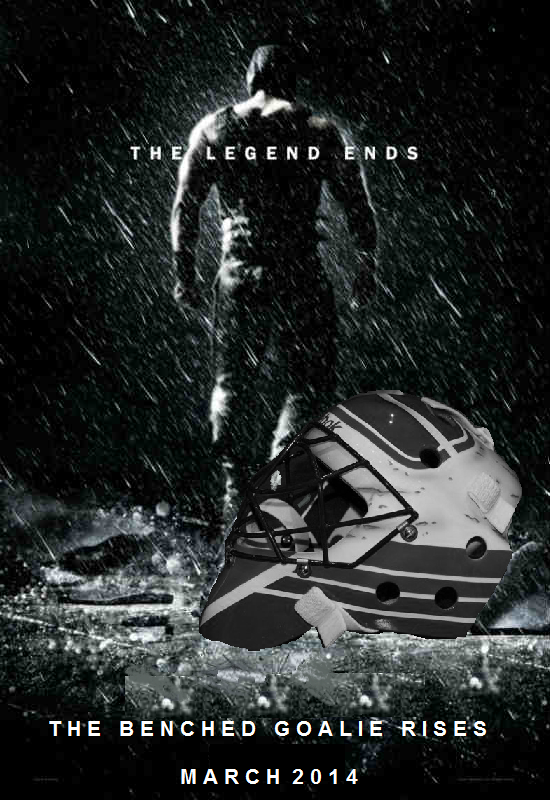 The analogy is rather clever even if it portrays Tortorella as the villain in this Canucks-Batman crossover: Robin took over for Batman after his spine was smashed, and benching Luongo during the Heritage Classic was most certainly the Bane that broke Luongo's bat. Luongo: Why didn't you just trade me? Torts: You don't fear being traded....You welcome it. Your punishment must be more severe. Torts: Yes, but not of your body...of your soul. Torts: Behind the bench, where I learned the truth about despair, as will you. If John Tortorella is the bane of the Canucks, then he should be fired along with Gillis, who fired three-time Adams Award nominee Alain Vigneault in order to hire Torts. Gillis shouldn't be allowed to execute an unending queue of coaches for their failure to produce a championship. It's especially surprising that Gillis hasn't been axed yet given the rumours that ownership intervened to prevent the GM from trading Ryan Kesler before the 2014 trade deadline. Supposedly, Francesco Aquilini didn't want Gillis initiating a full-scale rebuild of the club. However, such a move will be inevitable if Gillis remains with the team in July. The Canucks desperately need to retool their ranks, but no quality UFAs will likely opt to join a team that has been so disastrously mismanaged. At the same time, Kesler and other jaded players will likely want out of Vancouver this summer. With the veterans wanting out and no NHL-ready players signing on, the Canucks will have little choice but to blow up the roster and start again. I can understand why people would want to keep Gillis around. He has, after all, done enough good for the club to merit winning the NHL General Manager of the Year Award following the 2010-11 season. Ironically, that year was also the end of his effective leadership. When the highly-favoured Canucks collapsed in the 2011 Stanley Cup Final, Gillis seemed to lose the script that he had used to develop the team. Gillis' moves since 2011 have been a series of puzzling decisions (e.g. Hodgson for Kassian), near-decisions (e.g. the Luongo rumours that ended with Schneider getting traded), and sudden do-overs (e.g. the abrupt trade of Luongo to Florida). Such frantic activity suggests that Gillis is making ad hoc maneuvers with no conception of an overall strategy for the team's future--one that will be hampered by Luongo's lingering cap hit and Lack's imminent mental breakdown following Monday's game against the New York Islanders. For the sake of everyone involved--including the sanity of Gillis himself--it's time for a new GM in Vancouver.